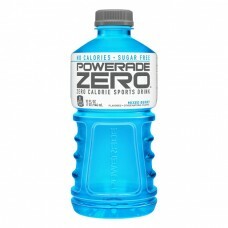 Powerade Zero™ Mixed Berry Zero Calorie Sports Drink. No calories. Sugar free. 0 calories per 12 fl oz serving. Flavored + other natural flavors. Ion4®. Sodium. Potassium. Calcium. Magnesium. Helps replenish 4 electrolytes lost in sweat. Please recycle. Consumer information call 1-800-343-0341. ©2016 The Coca-Cola Company.